Have you missed our recent Videos?? Click Here to Watch Now…! Register for ZERO Exam Now. The Exam is on 26th Feb 2018. Registration form bug has been solved. Students can register for the program now. South Indian Bank has released the most-awaited Interview call letter (admit card) for the recruitment of Probationary Clerk. Northern Power Distribution Company of Telangana Limited TSNPDCL, Warangal invites Online Applications from the qualified candidates for the recruitment of Junior Lineman JLM for filling up 2553 Vacancies on Direct Recruitment / General Recruitment Basis. The Last date to apply 19th March 2018. Staff Selection Commission (SSC) has released the list of candidates qualified for the Document Verification Process of SSC CHSL (Non-technical Staff) recruitment. The Document Verification will be conducted by the Regional Offices between 25-02-2018 and 15-03-2018. Staff Service Commission (SSC) has released the admit cards / Call Letter of the Combined Higher Secondary Level (10+2) Examination 2018 (SSC CHSL Exam 2018). SSC CHSL Online Written Exam will be conducted from March 4 to March 26, 2018. Fresh Batch Details for the Month of March updated for all branches. The Canara Bank PO Online written exam will be conducted on 04th of March 2018. Students cleared South Indian Bank Probationary Clerk Examination may attend Mock Interview Program on 23rd Feb @ Chennai Branch. ZERO Exam is scheduled to be conducted at all RACE Branches on 26th February 2018. Indian Railways has increased the upper age limit for Assistant Loco Pilot (ALP), Technician posts to 30 years (unreserved category), 33 years (OBC non-creamy layer) and 35 years (SC and ST category). Want to become a Bank / Central Govt employee in 2018? 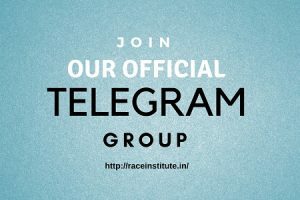 Join Chennai RACE Institute NOW…!! CRACK BANK / SSC EXAM. JOIN NOW..!! Export Credit Guarantee Corporation of India (ECGC) Ltd has released the list of candidates shortlisted for the Interview of its Probationary Officer Recruitment 2018-19. We congratulate the candidates shortlisted for the Interview Program. Our Mock Interview Panel Members have listed out the Important Interview Questions that are expected to be asked in the Real IBPS SO Interview. So, we suggest you be prepared for these Questions for the IBPS SO Interview. Insurance Regulatory and Development Authority of India (IRDAI) invites application for the post of Manager, Assistant General Manager, Deputy General Manager & General Manager vacancies through open competition on all India basis for its various offices. Eligible and Interested candidates may apply before 12 March 2018. IBPS today surprised everyone by releasing the IBPS SO Interview Call letter for the selected candidates in IBPS SO Mains Examination which was conducted in the month of 28th of January. RACE Students who are undergoing “Super Batch – SBI Clerk” Program at various RACE branches will be able to take this Sixty Online Mock Exams on their online exam portal. We “Research and Development Department” at RACE Institute has developed these 60 Mock exams for the aspirants who are preparing for the SBI Clerk Examination seriously and for those who are in a situation to grab SBI Clerk Job this year. Like us on Facebook, Join our Public Group on Facebook...! Get informed about all Recruitment Notifications…! Access to get Free Materials and Live Videos…! Our SSC All India Focus Team is about to start the Real Intensive Program for SSC CHSL Examination from tomorrow (6th Feb 2018) Students of RACE Institute, who have applied for SSC CHSL Examination can attend this program. SVC Cooperative Bank Limited (Multi-State Scheduled Bank), Mumbai invites applications for the recruitment of the Post of Customer Service Representative (CSR in Clerical Cadre) 2018-2019. Check the Important date, Salary, Eligibility, selection procedure and how to apply here…! Staff Selection Commission Junior Engineer (Civil, Mechanical, Electrical and Quantity Surveying & Contract) Examination – 2017, Uploading of Tentative Answer Keys. Tamil Nadu Public Service Commission (TNPSC) has announced the recruitment of Motor Vehicle Inspector posts under Tamil Nadu Transport Subordinate Service. Registration for IBPS SO and SIB Probationary Clerk Mock Interview is open. Candidates who have qualified in both IBPS SO and SIB Probationary Clerk vacancies must choose “IBPS SO & SIB PC” Option from the drop-down to attend Mock Interview in both the panels. Candidates must produce their “Interview call letter / Exam Result Printout” while attending this Mock Interview Program. Want to crack SBI Clerk / Junior Associate Exam 2018? Only Limited seats are available..!! JOIN NOW..!! SIB has revealed the Online Examination Results of the candidates appeared for the written examination. The call letter for the Personal Interview will be made available on the website soon. You can enrol RRB ALP Course in Chennai, Bengaluru, Chandigarh, Puducherry, Trivandrum, Madurai, Trichy, Coimbatore and Cochin branches only. >> Know More about RRB ALP Course or Call: 9043303030 / 7601808080 to enrol. INDIAN BANK, a leading Public-Sector Bank, with headquarters in Chennai invites applications from Indian citizens (Male) for the post of Clerk / Officer in JMG Scale I in the following Sports discipline under Sports Quota. Interested candidates can send their CV to hr@therace.in. Please mention your desired Post and Branch. Union Public Service Commission has released the official notification for Civil Service & Indian Forest Services (IFS) Preliminary examination through CS(P). The online application process has started today and closes on 6th March 2018 @ 6 PM.